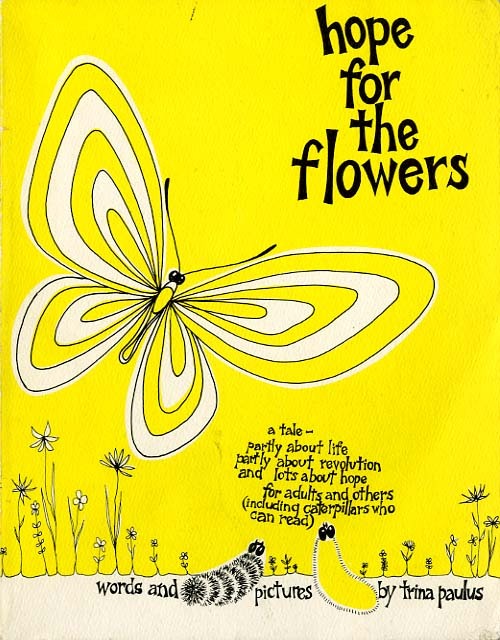 Hope for the Flowers is an enduring fable about two caterpillars, Yellow and Stripe, and their struggle to climb to the top of a caterpillar pillar only to discover they were meant to fly. It all starts when Stripe, the main character, first hatched from his cocoon. He began his life by eating the leaf he was born on. He realized that there was much more to life than just eating the leaf he lived on. He looked for a way to get up in the sky when suddenly he found himself at the base of a pillar made up of caterpillars struggling to get up in the sky as well. Here he meets Yellow who also wants to get to the top but feels bad about stepping on everybody. They go down the pillar and live together. But Stripe’s curiosity grew everyday and finally he decided that he will get to the top. Yellow however found out that to find their particular “more” or who they really are, is to enter the cocoon and try to be a butterfly. She triumphed and could then show Stripe what their life was really all about. Stripe then also makes a cocoon and at the end they fly off together. Hmmmm…. maybe it’s time for this caterpillar to read. This book looks beautiful.. I am going to buy it for my Kindergarten class..